Origin and Habitat: Harrisia pomanensis occurs in Argentina, Bolivia, Uruguay and in Paraguay in the Alto Paraguay, Boquerón, Central, Cordillera, Paraguarí, and Presidente Hayes departments. It is naturalised in Australia and elsewhere in the tropics and subtropics. Type locality: Poman, Catamarca, Argentina. Altitude range: It grows at elevations between 10 and 1,000 metres above sea level. Habitat and Ecology: This cactus occurs in the Chaco Region of Argentina, Paraguay, and Bolivia. It also occurs in Uruguay. It grows low lying in the borders, as well as inside the Dry Chaco forest of the western region. It grows in clearings within the Chacoan province, and below shrubs, mostly "jarillas" (Larrea spp. ), in the Monte province. Harrisia pomanensis is widely distributed and locally abundant throughout its range, and there are no major threats affecting it. It is favored by livestock grazing and is consumed by the Chacoan Peccary (Catagonus wagneri) in the dry season. Also Harrisia pomanensis you will find most of the night flowers are white and very fragrant to attract night flying moths for pollination. Description: Harrisia pomanensis (Eriocereus pomanensis) is a sprawling or clambering cactus to 3 m or more long, sometimes somewhat shrubby, it has arching, bluish-green, rhizome-like stems with four to six blunt, rounded ribs. Growth habit permitting this cactus to explore and asexually reproduce in its immediate habitat. The spine clusters have each one central up to 2 cm long and five to seven shorter radials. Up to 15 cm in length, the flowers are white. Harrisia pomanensis is wide-ranging and quite variable. Subspecies regelii tends to be more shrubby, with smaller stems having fewer spines; it occurs only in Argentina. Stem: Erect at first, then arching or even prostrate, sprawling or clambering, bluish-green, or grey-green, glaucous, nearly round in cross section, jointed to 3 m (or more) long and 2-4-(rarely to 8) cm in diameter. Ribs: 4-7(-rarely to 7) blunt, rounded, not tuberculate. Spines: Rigid, all subulate, needle-like, white rose-coloured or red when young, later whitish or greyish, tipped blackish. Central spine: Solitary, 10-20(-25) mm long. Radial spines: 5 to 8 about 1 cm long. Flowers: About 15 cm long. Flower-tube with ovate, acute scales 1 cm or more long, hairy in the axils. Outer perianth-segments linear, acute; inner perianth segments oblong, acutish, white. Stigma-lobes numerous, linear. Fruit: Spherical, slightly tuberculate, spineless, with a few scales3-5 cm in diameter red, splitting laterally to expose the spongy white funicles and black seeds. Notes: Harrisia jusbertii is considered by some to possibly be a natural intergenic hybrid betwee Harrisia pomanensis, and Echinopsis eyriesii rather than a pure species. 4) Oakley, L., Pin, A. & Duarte, W. 2013. “Harrisia pomanensis.” The IUCN Red List of Threatened Species. Version 2014.3. <www.iucnredlist.org>. Downloaded on 27 December 2014. Cultivation and Propagation: Harrisia pomanensis (Eriocereus pomanensis) presents no problems in cultivation and will do well in a sunny spot in a cactus house. Soil: Grow them in rich, porous, sandy soil and let their soil dry out between waterings. If potted, repot in the spring if their roots become cramped. Generally, they should be repotted every other year in order to provide fresh soil. However, this doesn't necessarily mean they'll need larger containers. Fill about a quarter of the pot with broken crocks, gravel, etc. to promote good drainage. After repotting, do not water for a week or more. Hardiness: These plants will not tolerate extended periods of frost; they can survive to a minimum temperature of -4°C. Traditional uses: The Lengua-Maskoy natives eat the raw fruits, as well as boiled or roasted roots of this species. Propagation: It can be increased by seeds or cuttings. Cuttings of healthy shoots can be taken in the spring and summer, Cut the stem with a sharp, sterile knife just above a bud or shoot (a 7-10cm long tip or branch is most suitable for propagation) Leave the cutting in a warm, dry place for a week or weeks (depending on how thick the cutting is) until a callus forms over the wound. Once the callus forms, the cutting may be inserted into a container filled with firmed cactus potting mix topped with a surface layer of coarse grit. They should be placed in the coarse grit only; this prevents the cut end from becoming too wet and allows the roots to penetrate the rich compost underneath. The cuttings should root in 2 to 6 weeks. 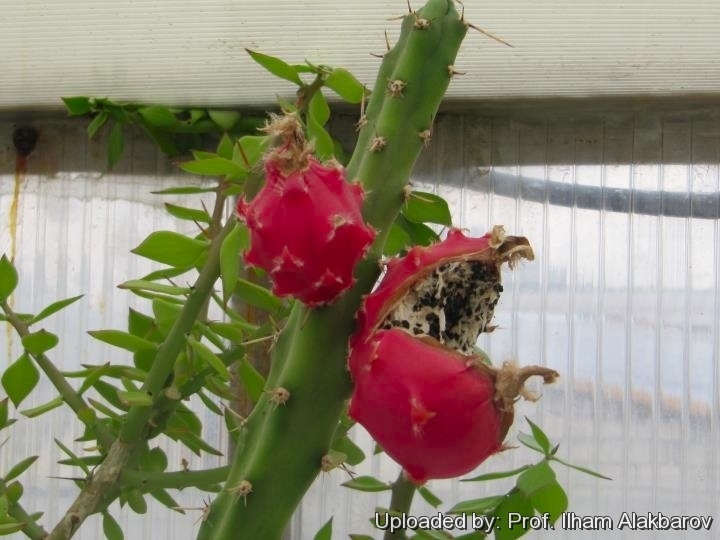 Garden uses: Harrisia pomanensis forms long columns that are great for grafting valuable species of cacti and - differently from other common grafting stock - don’t induces plants to elongate out of character and produce weak spination. The scions on Harrisia don’t grow as fast as the ones grafted on other tender and stronger stock, but they prosper very easy and can be kept in dark and cold places in winter. It can easily endure some light frost, too.